Christmas and cookies go hand-in-hand. We’ve posted numerous cookie recipes in the past few years, but truly, you can’t have too many khurabia (kurabia) recipes, if you ask me! Here’s one which uses only 3 ingredients. It appeared in the Milwaukee Journal Sentinel, and was submitted by Ani Saryan who said her grandmother, Martha Auer of Greenfield, WI, has been making them for 60 years. NOTE: This recipe has not been tested by The Armenian Kitchen. 1. Clarify butter: Melt butter over low heat in a heavy saucepan without stirring. When the butter is completely melted, skim the foam off the top and discard it. You will see a clear oily layer atop milk solids. Slowly pour the clear liquid into a measuring cup, leaving the milk solids in the saucepan; discard them. Measure 1 cup of the clarified butter and put in refrigerator until it's hard (solid) enough to beat. 2. In bowl, whip butter (with an electric beater) until it's almost white. Add sugar and whip until mixed. 3. Using a wooden spoon, add flour and then knead it with your hands, like kneading bread dough. This incorporates all of the flour into the mixture. It takes about 3 to 4 minutes. The sugar granules will break down a little bit, and you should be able to roll it out with your hands and the dough will all stick together as one ball. In Armenian this is called ‘shaghel’. This kneading process allows the sugar crystals to become less grainy, to disintegrate, and in the end khurabia will be more delicate and melt in your mouth. NOTE: Depending on the environment, humidity and weather, you might have to put in an additional spoonful of flour and mix it in. If the dough gets too soft, you also may put it in the refrigerator for a few minutes to make it more workable. 5. 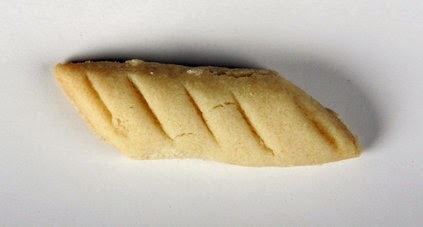 Take a handful of dough and roll with palm of hand on a cutting board into a rope until it is the diameter of a nickel. Cut into about 2- to 2 ½-inch pieces, on the diagonal, and put on an ungreased cookie sheet. Leave room between the cookies as they will expand a little in the oven. If desired, use a fork to make little hatch marks on the top of the dough for decoration. 6. Bake in preheated oven 15 minutes. Remove cookies from oven but leave them on the sheet to cool. Do not remove from cookie sheet until they are cool. Khurabia may be stored in the freezer. From what I remember from my mom, the real art is to get the cookies to come out crumbly, not hard, not dry. They have to be just slightly off-white but not raw.